5/11/17 - Frogland Friends kits available now! 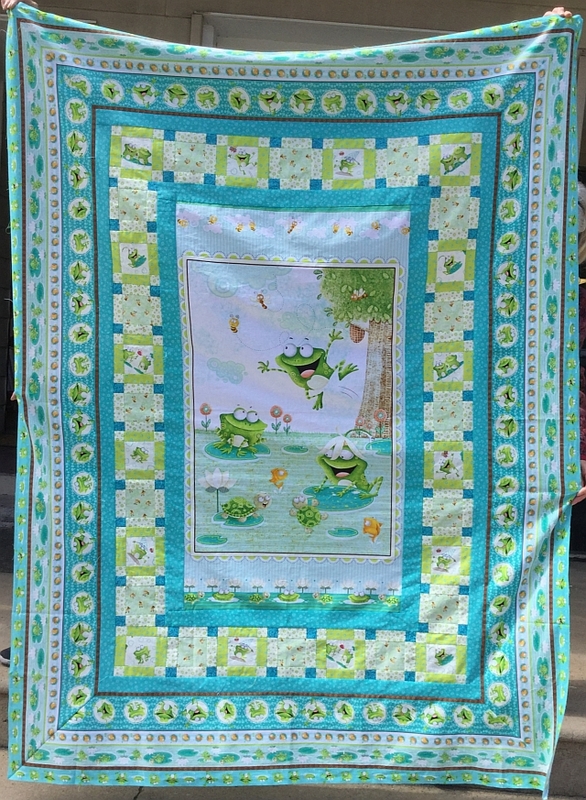 “Frogland Friends” is Nidhi Wadhwa’s second collection for Henry glass and showcases her playful frogs sitting with their friends in colors of green, aqua, brown, cream & teal. 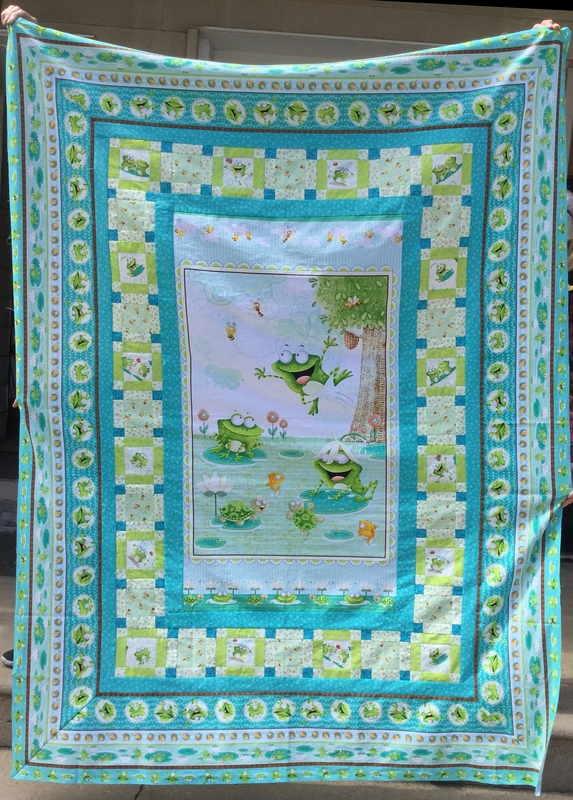 Kits for the 52" x 72" quilt top shown in the picture above (free pattern included) are available now in the shop for $65. If you'd like to purchase a kit over the phone and have it shipped, please call the shop at (610)900-4700 for more info. Click the image above or click HERE to visit the gallery. Enjoy! 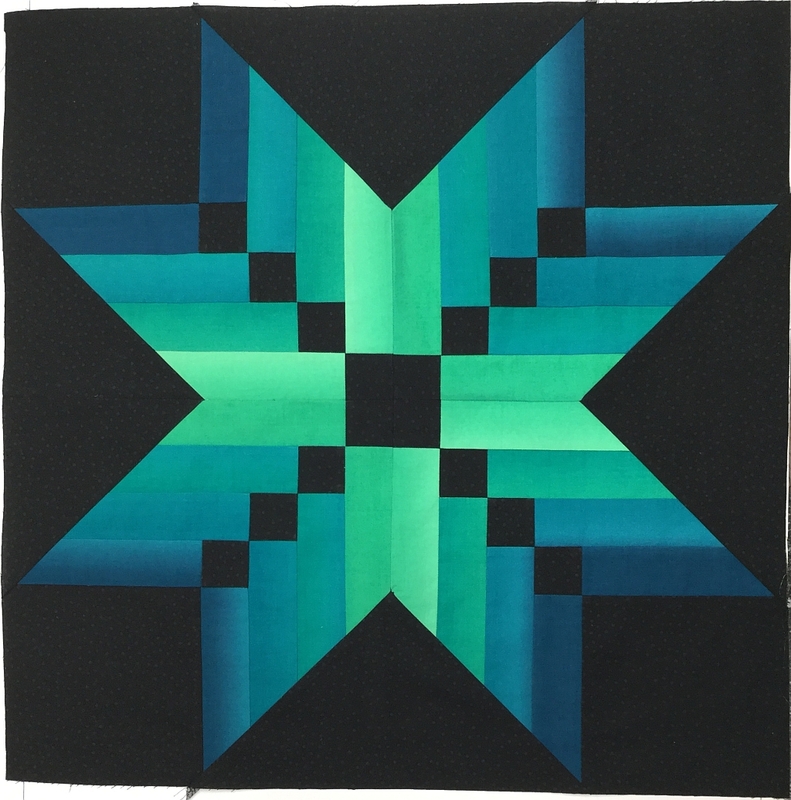 The Daughters of Zion have hand-quilted this beautiful 88" x 106" "Welsh" pattern quilt. 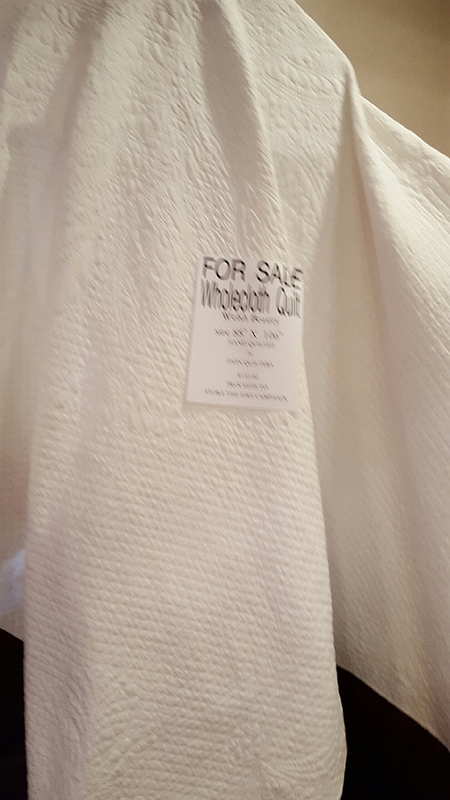 Sale price is only $350. 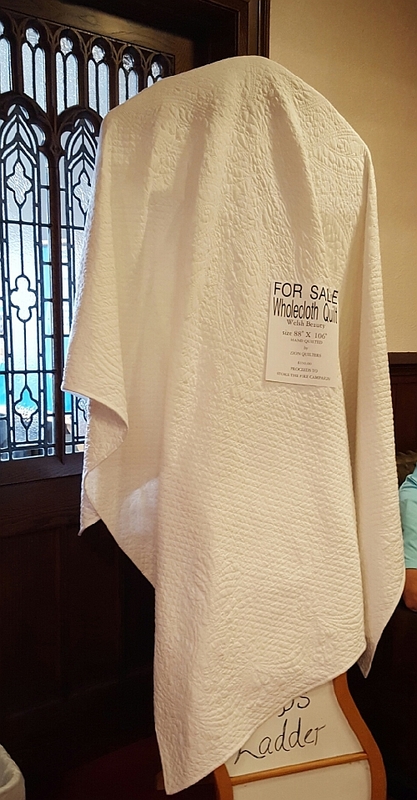 Please contact the Zion UCC office at (610)377-1191 if interested. Learn how the 60 degree triangle ruler turns simple rectangles into stunning triangles for every season. This 23" Table Topper makes a wonderful addition for any occasion! This beautiful tulip table runner created by Maryann Templin is a great addition to any Spring decor. The finished size is 21 x 44 ½ inches and has 4 paper pieced tulips. The scallop border adds a great finishing touch! This easy machine sewn hot pad uses a custom interfacing template to make this class great for beginners! Barb Skiffington will teach this revolutionary new technique and demonstrate the endless design possibilities. Quilts of Valor - The next scheduled meeting at the Crow will be onSaturday, May 20th, at 10am. Feel free to bring your machines! Crazy Quilts are America's earliest quilt style. Crazies are only made from fancy fabrics, like silks and satins. If you agreed with either of these statements, you're not alone. Many people have all sorts of misconceptions about the Crazy Quilt style, its age, and its origins. Let's explore this colorful but often-misunderstood style a little more. 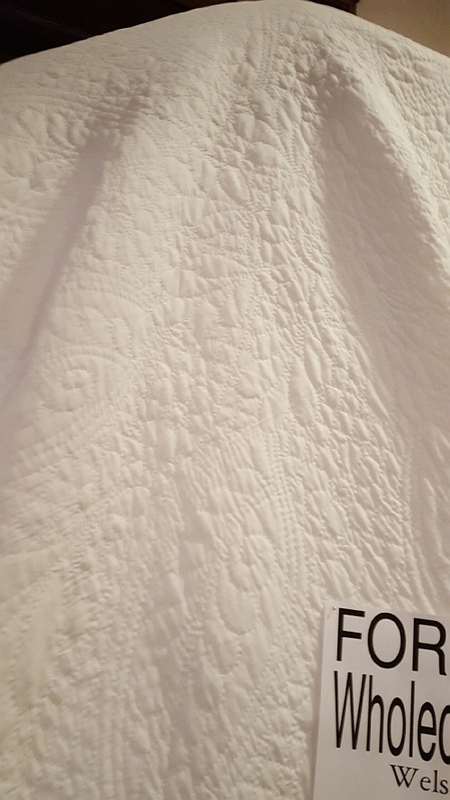 How old are Crazy Quilts? We don't really know. Camille Cognac, a national expert on Crazy Quilts, including their restoration, has pointed out that the European harlequin - that multi-patched jester with bells on his pointed hat - wears a costume very similar to a Crazy Quilt. According to Cognac, textiles with a crazy-patched look have also been documented in Egyptian tombs. 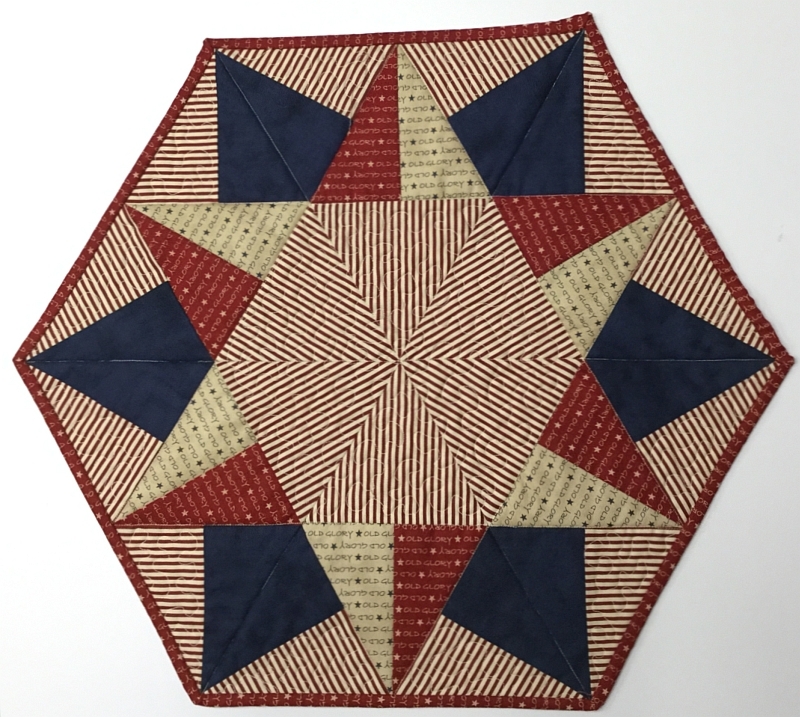 Quilting-book authors earlier in this century, including Marie Webster and Averil Colby, asserted that Crazy Quilts were the American Colonies' first quilts, by necessity. Fabric was scarce and expensive; why not just patch threadbare quilts with irregular scraps, and keep out the cold one more winter? 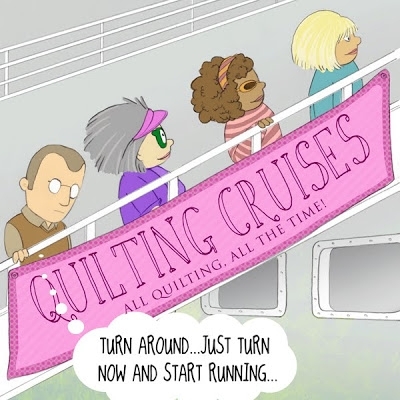 Although thoughts of "poor Martha" are appealing, the Crazy Quilt really seems to have sprung from a combination of factors begun by the Industrial Revolution. By 1850, American companies were manufacturing good-quality fabrics that were colorfast more often than not. (Consistently colorfast fabrics were not available until later in the 19th century, when washday blues and Turkey reds appeared.) Fabric prices moderated. Thanks to higher-paying factory jobs, women could actually afford to buy cloth, instead of going to the trouble of weaving it. Also, sewing machines, which had been used by commercial sewers for years, became increasingly affordable for the average family, thanks to the advent of the "layaway plan." Family sewing was accomplished more quickly, giving the average woman time for more genteel pursuits, like embroidery and lace making. The Civil War changed all that. Fabrics, if they were available at all, skyrocketed in price - especially for the South, which had few factories of any kind. Women's extra energy went toward their families, instead of fancywork. Exhibitions, called sanitary fairs, became a popular way of showing off one's skills, as well as collecting quilts, shirts and funds for soldiers. It is from this period, at a Sanitary Fair in Cleveland, Ohio, that the first published mention of Crazy Quilts appears. In February 1864, Mary Brayton wrote: "Above the grim surroundings of this busy corner hangs the 'crazy bed quilt', a grotesque piece of newspaper patchwork, which is sold by lot every day, with the express condition that the unlucky possessor is not obliged to keep it, but will be allowed to present it to the fair. A considerable sum of money and a great deal of fun are realized by this transaction which takes place every noon just as the clock strikes twelve." Perhaps Mrs. Brayton's complaints were just sour grapes that she never won the bid! Only a year later, Peterson's Magazine was recommending "mosaic applique" and "oriental embroidery" for a look quite similar to todays "controlled" Crazy Quilts. By 1874, the "grotesque" Crazy had been renamed "ornamental fancy work" in the pages of Peterson's. The war was over; prosperity had begun. And everyone was thinking about stitching a Crazy Quilt.